This week, the Stellar network experienced a ledger fork that is related to a failure of the underlying Ripple/Stellar consensus system. We are completing our review of the impact, but early reports indicate that the impact was not major. We are reaching out to all the known gateways and exchanges to see what we can do to assist. We are reaching out to all the known gateways and exchanges to see what we can do to assist. And what exactly are those "all gateways and exchanges"? Can't wait the answer from RL experts. I believe the Ripple protocol is immune to forking when properly implemented. The following diagram illustrates that a fork is impossible. 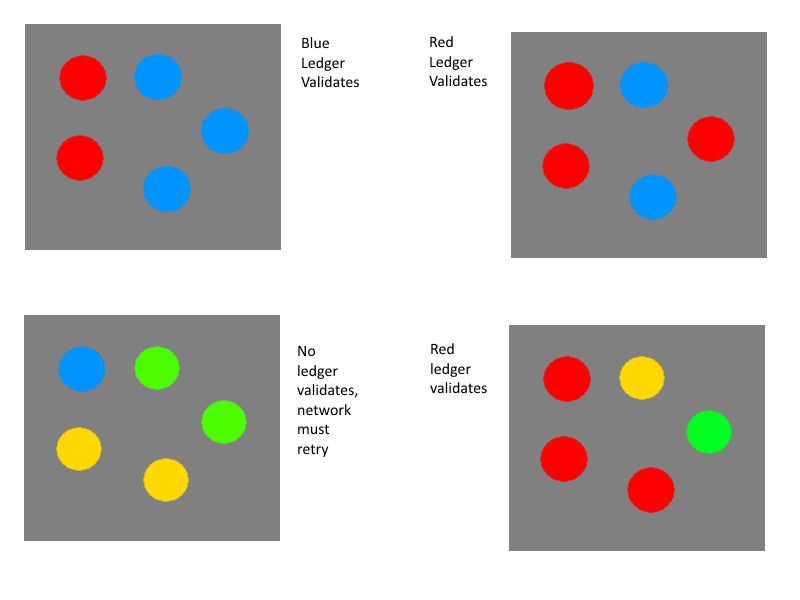 The 5 circles represent validators, the majority (3 or more) of which must agree to advance to the next ledger. For there to be a fork, an additional majority must agree to a different next ledger. So, to illustrate a fork, color a majority of the circles one color and then simultaneously color a different majority another color. Clearly, this is impossible. JoelKatz wrote: I believe the Ripple protocol is immune to forking when properly implemented. Can you show documentation for the proper way to implement it properly? This knowledge is needed to know how to judge whether Ripple is at risk of forking. Perhaps a twitter bot could be created to advertise the results of a check for this. I mean what if a majority of nodes conspire to defraud a minority and dos the majority to become the temporary majority? So what I'm getting out of this is, Stellar's validators are colorblind. ...if by 'validators' you mean 'system maintenance team' ... and by 'colorblind', you mean 'inept'....then I think you're dead on. Robertharpool wrote: ...if by 'validators' you mean 'system maintenance team' ... and by 'colorblind', you mean 'inept'....then I think you're dead on.